Project obstacles and solutions: The Cadence is a five story mixed use retail/apartment building in Nashville's Music Row. Developer Phoenix Property Group out of Dallas, Texas designed the building to have first floor retail space and multiple family dwellings throughout the rest of the building. R.C. Matthews was selected as the general contractor for the project. 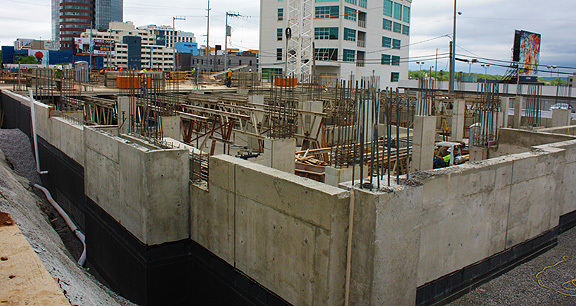 IMI supplied 5,000 yards of concrete for all of the poured walls, columns and decks. The decks were post-tensioned. The concrete had to meet 3,000 psi before the tendons were stretched. Depending upon the weather forecast and the construction schedule, tendons were stretched in as little as 24 hours. IMI QC/QA worked with R.C. Matthews to deliver concrete that would remain workable for their crews, but would gain the early strength needed for the post tensioning. Mix designs were reworked with each pour to meet the specifications. Construction on the Cadence is scheduled to be completed by early 2016. For more information on pouring concrete for early strength in a post-tensioned construction, contact your IMI sales representative. Click here.